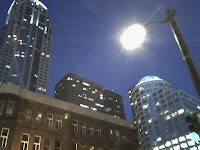 This week finds me back in Seattle once again--more meetings with Boeing despite the machinists strike. After work on Tuesday, I finally got the chance to visit Elliott's Oyster House at Pier 56 in Seattle. I had missed this restaurant last time because our group hadn't made any reservations, and the wait was well over an hour. This time, I made reservations. Boy, am I glad I did! The Northwest is known for seafood, and Elliott's is supposed to be the best in Seattle. 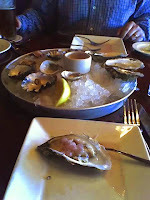 For an appetizer, Jay, my travel companion, and I tried a sampler recommended by our server, and we were thankful for his help in choosing oysters. I mean, I love oysters, but I'm no aficionado. The oyster menu had a dizzying array of 39 different kinds of oysters, with names indicating their source waters--names like Eld Inlet and Penn Cove Select. I have no idea about these things, so we let the waiter handle our order. Since oysters prefer colder water and a later harvest (Elliott's New Year Oyster Celebration is on November 1st), our waiter recommended Canadian and more northerly oysters. We ended up getting a sampler including Kusshi1 oysters from Vancouver Island, eastern oysters called Totten Virginica2 from Totten Inlet, Washington, and Kumamoto3 oysters from South Sound, Washington. The oysters were delicious, served raw. The oysters had a nutty, lemony flavor, accented nicely with a champagne, red rice vinegar and cracked pepper sorbet. Simply scrumptious! After the oysters, I had a nice salmon fillet cooked on an alderwood plank, served with new potatoes and green beans. This fish was really nice. When coming to Seattle, it is absolutely mandatory to eat the salmon, and eat it I did! Yet, those oysters were so good, I think next time I visit, I may just skip the entree and go for three or four dozen oysters instead. If you even remotely enjoy seafood, Elliott's Oyster House is a must visit. Sounds great! I wish I had been there to enjoy it with you. I know you would love it! So too would Ed, Adolfo and Eddie. Those oysters were so scrumptious, I'm thinking of going there again tonight!! i'm getting quite into seafood. though i have yet to try oysters. I will attest to mdautrich gagging on mashed potatoes. I would suggest that you not even invite her to have a taste, or mention the word while you are dining. I can eat mashed potatoes until the cows come home. I tried a raw oyster once - I never did get it down! I have a real issue with anything that slimy & fishy tasting! YUCK!